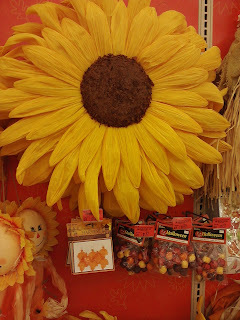 Awhile ago I was walking around a local craft supply store and this large sunflower caught my eye. I just thought it was cute and would look nice on my front door. That is until I checked out the price tag on that cutie, $19.99. It's cute, but not $20 cute as far as I was concerned. So, me being me and in the craft store, I checked out a few supplies to make my own. I purchased my supplies which came in at a whopping $3.00 along with a few things I already had on hand at home ( hot glue, paint, and cardboard... yes I was careful! ). My supplies were simple: twisted paper ribbon, styrofoam circle, glue, paint, and a cardboard circle. First figure out the size you want. The cardboard will be the base. Next un-twist the paper ribbon and cut pieces into petal shapes. I then dry brushed my paint on the "petals", after they dry start gluing onto the cardboard. Unfortunately, I neglected to take pictures along the way sooo......oops! I painted the styrofoam circle brown then glued it on. The welcome sign was my added feature. I'm quite pleased with how it came out. And I didn't have to spend $20!